A legitimate question about the difference between turn off, turn on and restart (reboot) on the mobile phone or smart phones! Of course, everyone knows that brings power off on the smart phone to silence and that when you restart the smartphone operating system is shut down and turn on. However, many mobile phone users use the restart too rare in the belief that turning off and on is the same. But that's not quite so. See also: ► ... difference between power off/on and restart (reboot)! Because only when you restart the smart phone is it a completely shut down, the memory is cleared, all APPs are turn off and restarted. This is especially so when the mobile phone or smart phone, Quick Start is enabled. So quiet times to restart! 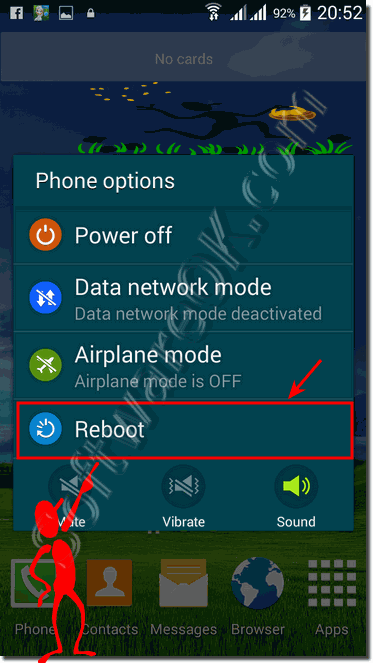 (Image-1) power off/on and restart of the android smart phone! General on all phones, smartphones or iPhon, as well as the Windows Phone is a reboot always good, because all drivers are reloaded from the system and it is also released a lot of memory and the mobile device works fluently and faster, which proves to be very beneficial can. The apps that may have been running useless in the background are also all closed, which also improves performance on any mobile device, both on the phone, tablet and not to forget the MS Surface PRO. Android - FAQ-6: What is the difference between power off/on and restart of the mobile smart phone?